Aquaponics combines aquaculture with traditional fruit, vegetable and herb farming using eco friendly and organic bio filtration from the plants to recycle water for the fish. The fish produce waste that help the plants grow. The entire system uses 85-90% less water than traditional dirt farming. In aquaponics, you can grow almost anything, year round, and crop rotation is never a problem. Unlike hydroponics which produces waste water and requires monthly chemical doses, aquaponics allows for the harvesting of fish and uses the fish waste as the chemicals to feed the plants. There is no waste except for fish emulsion which can be used for raised grow beds and potted plants or used to feed additional grow beds in your aquaponics system. We filter our waste because we don’t grow enough plants, but this is not necessary. The energy to feed a family of four is about $100 per year for a 1A pump. Heating is done via natural solar methods (not electricity). Fish food can be home grown. 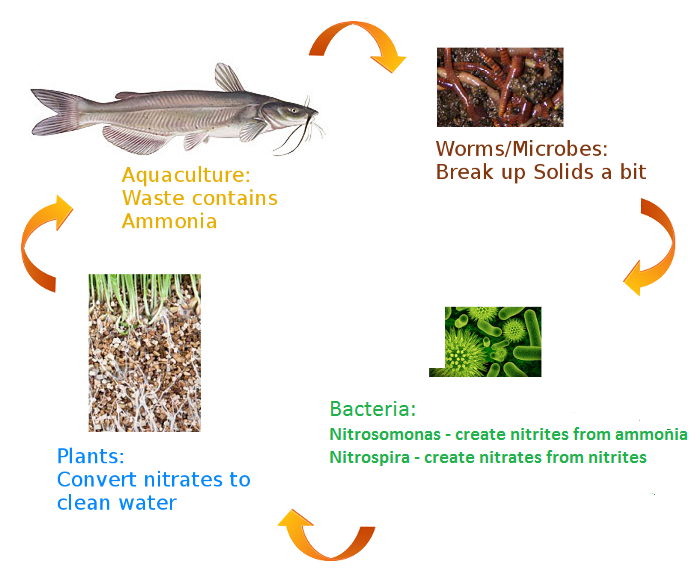 Various compost methods produce fish food and get rid of human trash at the same time. The investment of even a small, family sized greenhouse of 500 gallons, backup pumps, solar hot water heater, starter fish, starter plants, gravel, plumbing, etc is less than $2500. Small herb gardens can be created for only a few hundred dollars. This investment pays for itself almost within the first year. Aquaponics is virtually maintenance free. You need to feed your fish 1 or 2x a day, monitor temperature, plan your upcoming crops and harvest a meal at a time. There are no weeds, no tilling, and the watering is automatic too. Aquaponics is completely organic. It must be organic because pesticides will kill the fish. You can walk into your backyard and harvest food year round, fresh – instead of eating something that is picked before it’s fully ripe, and then served to you a month later. Aquaponics a closed loop system (water isn’t just poured on the ground, it is recirculated). Plants evaporate some water, but overall the same volume of vegetation can be harvested with very little additional water. In soil crops you are limited to the amount of nutrients in the ground. Aquaponics pumps fresh, natural nutrients every few hours into the grow medium and crops can be harvested repeatedly. Provide for your family and extra for barter without depending on a world food system that is currently unsustainable. In a crisis, you may be the only one with fresh food. This is information that my son and I have started, originally as a boy scouts project. This aquaponics system has morphed into something about fish, aquaculture, aeroponics, plant cloning, urban homesteading and more… all in our backyard. We’ve included plans and notes on the various aquaponics systems that we’ve tried, and hope that you are inspired to do something similar for your own family. Please contact us with any questions and my son and I will do our best to help you out. Here are the Aquaponics Systems Pictures, though they aren’t sorted yet.